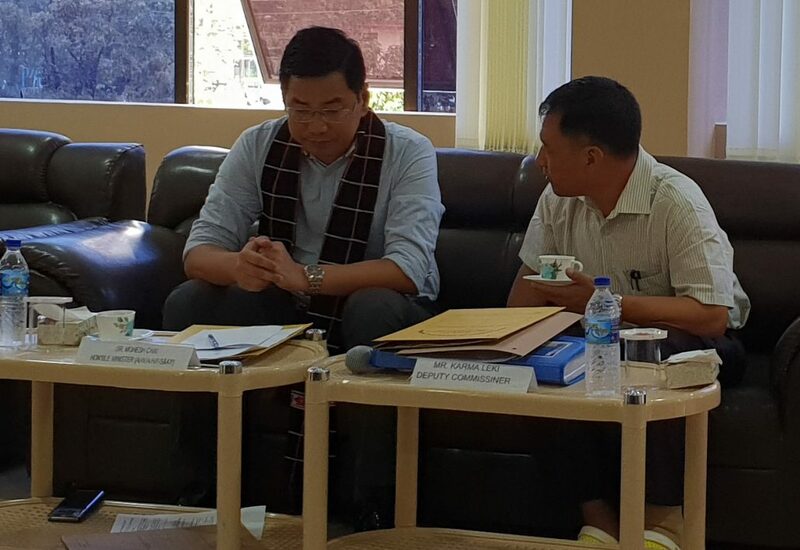 A preliminary meeting in connection with State Infrastructure Development Fund (SIDF) of Arunachal Pradesh was held at the conference hall of mini secretariat at Tezu on Wednesday. Attending the meeting, Agriculture, Horticulture and Sports & Youth Affairs Minister, Dr Mohesh Chai asked the departments to prepare and propose schemes and plans that are innovative and new. “Prepare projects which are challenging yet feasible and make sure every aspect of the project is thoroughly researched upon before submitting it,” Chai told the officers of the departments concerned. The Minister also touched upon some of the burning issues pertaining to the district. He expressed his concern over the poor performance of Class X and XII CBSE results which was announced recently. Acknowledging that one of the main concerns pertaining to Lohit district is flood, the Minister asked the DDMO to conduct an awareness camp in villages, especially at Danglat to educate the people of the danger of venturing out in the forests and rivers during the monsoon. Dr Chai further urged upon all the district officers and heads to be sincere and contribute in making Lohit a model district in the State. Speaking on the occasion, Lohit Deputy Commissioner Karma Leki informed that a district committee on SIDF will be constituted under the chairmanship of MLA and other members shortly for selection of projects and schemes. Meanwhile as a flood preparedness measure, the Deputy Commissioner instructed the DDMO to activate the Flood Response Team and district control room. Directions were also given to designate relief camps, prepare resource mapping and constitute rescue team. The meeting further saw the PWD, RWD, WRD, Education, Health and Family Welfare Departments present their proposals. Earlier, Dr Chai, who is also the local MLA, was accorded a warm welcome by the Deputy Commissioner, SP, HoDs, officers, panchayat members and public leaders of Tezu-Sunpura constituency on his maiden visit to his home constituency after assuming the additional key portfolio of Minister of Agriculture, Horticulture, Fishery and Sports and Youth Affairs. In a brief interaction with the members present, Chai paid his gratitude to Chief Minister Pema Khandu for showing trust on him and giving him the additional responsibility to fulfill the hope and aspirations of the people of State.